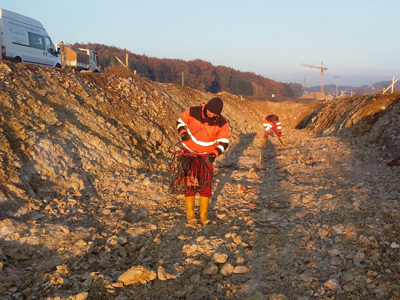 Geophysics can provide beneficial support to construction and infrastructure projects (road and railway construction, large buildings, transmission routes, wind farms etc.) in various situations. In addition to investigations regarding the structure of the subsurface and detection of weak points (e.g. cavities of natural and anthropogenic origin), relevant mechanical parameters bulk modulus, shear modulus, elastic modulus, Poisson's ratio or electrical parameters electrical resisitance, conductivity can be obtained. 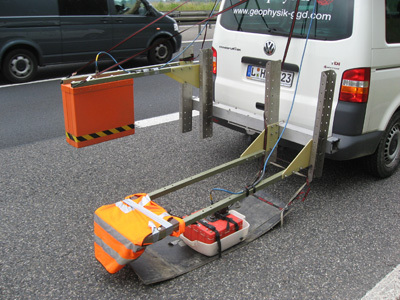 Commonly applied methods are gravimetry and shallow seismics, but also geoelectrical methods and ground penetrating radar. Moreover we offer vibration (peak particle velocity, ppv) measurements according to DIN 4150 in the course of ongoing constructions or geophysical measurements. The list of our clients in the field of construction and infrastructure includes inter alia, Deutsche Bahn, e.on, Leonhard Weiß, TenneT, Landesamt Bau Sachsen-Anhalt.